Moving from Key Largo to the Charleston area 2 decades ago, Jeff Houts has a perspective of the keysy breezy fun loving attitude. When this attitude is mixed with good time music and a cool place to play, it is a pleasant vibe for all. 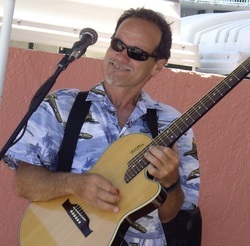 Combining electric and acoustic sounds from one guitar, he is able to draw from considerable band experience (Tropicools and Swell) to make the solo performance unique by sculpting the acoustic sounds with electric lead tones. The result is music that is full but not loud. The energetic musician plays a combination of classic rock, folk, alternative and reggae that you will recognize and happily tap your feet to. Quality, passion and the fun factor makes this musician worth a listen.